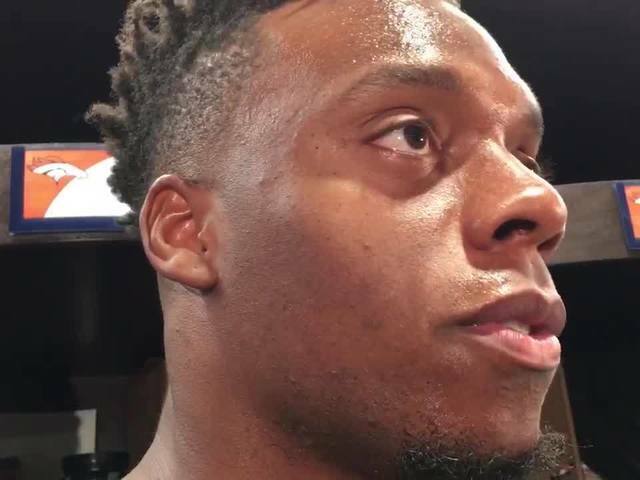 DENVER – A person apparently upset at NFL player Brandon Marshall’s decision to kneel during the national anthem in the Denver Broncos season opener penned a letter filled with racist and hateful rhetoric to the linebacker. Marshall shared the letter with his followers on Instagram Friday. The original posts can be seen below. WARNING: They both contain graphic language. Marshall said the letter shines a light on the social injustice issues he has spoken out against. He chose to reveal this document because of the threatening nature. "I was taken back. I had to read it over again. Did somebody really send this to me? It first said you are a great player -- then 'not!' It's disgusting, disheartening, deplorable," Marshall said at his locker on Friday. "That stuff still exists. That's why I put it out there, to expose what everybody might have thought was put to rest. That stuff is still alive." Marshall responded on his Instagram account to the letter Friday morning, and appreciated the support he received. He was urged by at least one team official to expose the letter in hopes of discovering the author. "The hatred by some against people of color is one of the reasons we are where we're at in the world today," wrote Marshall. Marshall revealed the letter to the Broncos two weeks ago after spending an hour one afternoon going through a huge bag of accumulated mail. The Broncos' in-house security has been investigating since. NFL teams typically work with law enforcement on issues of this nature. Marshall has received multiple threatening letters since he chose to kneel for the national anthem. Denver Public Schools confirmed that there is no Mrs. Jackson who teaches 6th grade at Martin Luther King, and no students from the school sent letters to any athletes. The back of the envelope praised Marshall as a "Great Player," he said, a cover created to compel him read it. Marshall believes the letter was written by an adult and remains hopeful the author will be traced because of fingerprints on the document. "It was disgusting," teammate Shane Ray said Friday. Added linebacker Corey Nelson, "Brandon knows we support him." Marshall kneeled for the first eight games of the regular season. He stood for the anthem at Oakland on Nov. 6, in large part because, following a meeting with Denver Police chief Robert White, the department modified its use of force policy. Marshall is not the only NFL player who was racially attacked. New York Giants Nikita Whitlock, who's black, had his New Jersey home broken into and racial slurs painted on multiple walls inside his family's home.